… and the aircraft was recovered. On April 19, 1970 while on a Command and Control mission, 624 was brought down by ground fire in Vietnam, the aircraft was again recovered. Just a few days later, on April 25, 1970 – while on a Troop Carrier mission, she was brought down again by mortar fire in Vietnam, the aircraft was recovered yet again. She remained in service in Vietnam until October, 1970. In addition to the 61st, she also served with 79 Trans Co, and 119 Aviation Co. Shipped back to the US in November 1970, she was on loan to the University of Michigan, Office of Naval Research, then sent to a US Army Base in Germany – Pirmasens Depot, in February of 1983. She served in many units in Germany, including: VII Coscom Avn, 349th Aviation, USA Pad, 48th Aviation Co, 48/223rd Aviation Battalion, and HHC 2nd Armed Cav. After service in Germany and a quick overhaul, 624 was sent to Korea in 1988 and served with the 2nd Infantry Division at Camp Casey. Then from late 1989 until 2003, she served with the Alabama National Guard in Birmingham. Maintenance at Army Aviation Service Facility #2 (Alabama) in 2003 was the last Army entry in her log books. This ol’girl has a long and storied career. In 2004, 624 was transferred to the Army Aviation Heritage Museum. She was received intact via truck, but not flyable. She was restored back to flying condition, with the historically accurate paint scheme honoring the 61st AHC, which was her first combat unit in Vietnam. FAA Certified N624HF in 2005, she has flown countless airshows, re-enactments, and thousands of passengers on our ride program. *Notably, AAHF’s current Administrative Director, Retired Army LTC & Huey Pilot, Rick Welch, flew 624, during his first assignment in Kitzingen, Germany with the 3rd Aviation Battalion Combat (ABC). In addition to his first checkride in Germany, he’s had a few interesting missions in 624. Initially, his first in-country checkride in 1978, an “ORTT” (Operational Readiness Training Test) in 1979, and on June 30, 1980 “The Casino Pad Mission”. After sundown, in the alley between the bank and the next building, the robber was dispatched by a GSG9 Officer (Grenzschutzgruppe 9 der Bundespolizei, Border Protection Group 9 of the German Federal Police). The following day, Rick flew the money and the VP’s back to the American Express Bank in Frankfurt. Another AAHF volunteer member, John “Motown” Gaines, was a door gunner on 624 during Vietnam. He completed three tours in Vietnam, starting with being a CH-47 Chinook door gunner with the 180th Assault Helicopter Co. known as “Big Windy”. After a short ten day leave, we went back and served with the 52nd Security Forces in Pleiku. He was only there a few weeks as he wanted to get back into helicopters. He found a slot in the 61st Assault Helicopter Company, based at LZ English. According to Motown, his first flight with the 61st, was a “milk run” in 624. Two days later he went on his first “LRRP Extraction” (sent to pick up a Long-Range Reconnaissance Team. Motown was a successful gunner, scoring several kills and consistently defending his crews while on missions. He was sent to the 61st’s gunships, the Star Blazers for the last eight months of his third tour. Motown loved flying on “Frog Hogs” which was a special gunship with a 40mm, 2 door gunners and rocket pods. Miraculously surviving 3 tours as a gunner in Vietnam, he went home in 1969 and thought he’d never fly on a Huey again. In fall 2010, Motown was getting groceries on the way home from a VA appointment. As usual he was wearing his flight jacket with his Vietnam 61st AHC patches. Someone in the store his 624 patch and struck up a conversation about how he flew on a ride in that aircraft just 2 weeks ago. Motown thought 624 was long gone (and the guy was crazy) so it took some major effort to convince him that Huey 624 was intact, still flying, and right down the street. A couple weeks later, Motown was breaking in a new motorcycle and decided to go see for himself what the AAHF was about, and whether or not 624 was there. Upon getting there, and waiting for what seemed like an eternity for a hangar door to open, there sat 624 with 3 other flyable Hueys. Let’s just say that was an emotional reunion for a Vietnam Veteran Door Gunner and his trusty Huey. 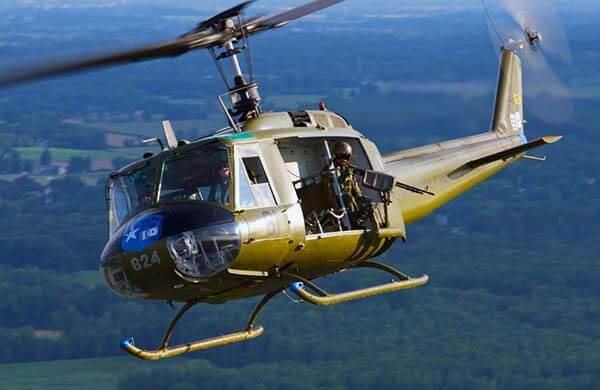 One of the mechanics saw him in tears, and even went over to Motown to make sure he was ok. Not long after that, he joined the foundation and started volunteering, and rides again in his favorite Huey 624.